The Muppets are back, and funnier than ever. Continuing from the Jason Segel movie in 2011, the movie acknowledges that its a sequel, its own movie, and part of a popular franchise. The film uses this meta humor to full advantage, and is a great musical, the songs calling back to the classic The Muppet Show of the 70s. The movie surprisingly focuses on the Muppets crew, since the last movie focused more on Jason Segel and the newest muppet, Walter. While Walter returns, he takes a backseat as the rest of the Muppets get a new manager, Dominic Badguy, played by Ricky Gervais ( The Office, Night at the Museum), and start playing to sold out crowds all over the world. At the same time, the World’s Number One Criminal, Constantine, escapes from prison and poses as Kermit the Frog. 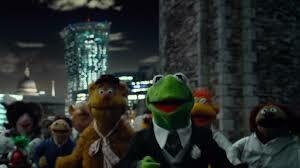 While the Muppets play their shows, Constantine and Dominic perform heists at banks and museums, while the real Kermit is thrown into a Russian Gulag lead by Tina Fey (Mean Girls, Megamind) as the prison guard Nadya. The crimes are being investigated by Sam Eagle and Jean Pierre Napoleon, played by Ty Burrell (Modern Family), who deserve a spin off movie together, they were so funny. 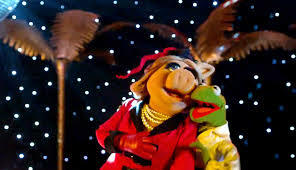 The climax includes Kermit’s escape from prison, him trying to stop Ms. Piggy from marrying Constantine, and an epic battle on top of the Tower of London. The film ends with a requirement of every Muppets movie: the cast singing “Together Again”. One other requirement of a Muppets movie is the cameos. And if you thought Marvel movies overused cameos, Disney has taken it to a whole new level. One of the best cameos was Danny ‘Machete Don’t Tweet’ Trejo, who plays a prisoner in the Gulag, along with Tom Hiddleston (aka Loki from the Marvel movies), although Tom is harder to spot. Other special guest stars include Usher, Celine Dion, and Lady Gaga, just to name a few. But the 3 main human characters almost stole the show, working off of the Muppets well, helped by the fact that each of them play it so seriously. They’re not talking to puppets, they speak to them as equals, and when comedy is involved that makes the difference between laughter and a silent theater. The movie was hilarious; kids, teens, and adults will surely enjoy it.